If you want your desk to look nice but offer power ports and even USB charging then you just have to check out this desk USB and power bar. This black power cord is 6 feet long and easily screws into the wood of your desk and then will offer two power ports and two 3.1 amp USB ports for easy and quick charging. A power bar on your desk like this one will make your desk look great and now you always have power when you need it for charging your phone and your laptop. So get that loose power bar from your desk and get your Desk USB And Power Bar. If you like your DeWalt power tools and need a power bank then you have to check out this DeWalt USB Power Source. 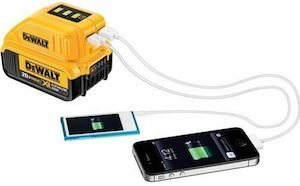 The power source makes any DeWalt 20 volt battery into a USB power bank by just sliding the battery into the Power Source and then offering 2 USB ports so that you can charge your USB devices. 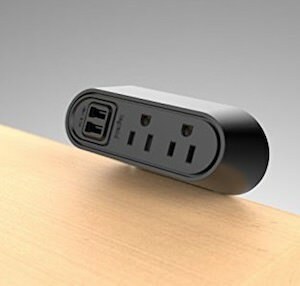 Now you can have all the power you need for your USB devices or your DeWalt power tools all thanks to this little gadget. So get out the batteries and slide them in to the DeWalt USB Power Source. If you like your tablet to be fixed to a location so that people can look at it then you should check out this tablet holder with magnetic back. 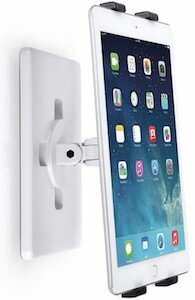 The tablet holder has 8 strong magnets in it and can hold a tablet sizes 7 – 12.9 inches and up to 10lb. The tablet holder can adjust in angles and as it has a metal back you can stick it on almost anything metal like a fridge, whiteboard, or maybe the inside of the hood of a car while working on it. Work or home a holder for your tablet like this is versatile and can be used anywhere you like so come check out this Tablet Holder With Magnetic Back. 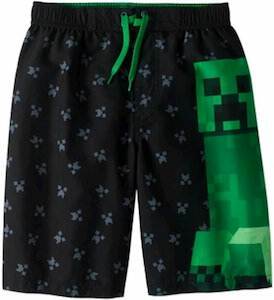 If your boy wants some cool swim shorts then you should check out these kids Minecraft Creeper swim trunks. The swim trunks comes in many sizes so that kids ages 4 – 12 can enjoy wearing them to swim class, the beach, or just the pool in the back yard. The swim trunks are black and have a pattern of the face of a creeper on it and then on the side you can see a big green creeper and that looks really cool especially as there is also a green drawstring to add a little bit more green. No worries these swim trunks will not explode but do make your kid smile so come check out these Kids Minecraft Creeper Swim Trunks. If you have the need for lots of USB ports for charging in your car then you should check out this Anker 5 Port USB Car Charger. 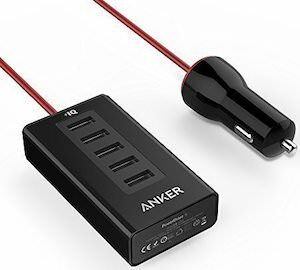 The Anker car charger offers 5 USB ports in a nice box and it can charge up to 10 amps for each port and it has a 3 feet long cable with a 12V connector to plug into the car. The nice long cable makes it perfect to reach the backseat so that the kids can plug in all their gadgets on a road trip. So no matter if you car has to few or not USB ports at all this is what can help so come check out the Anker 5 Port USB Car Charger.